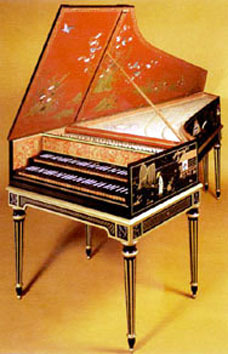 The two harpsichords below are examples of ornate French Doubles. As you can see, one is more elaborate than the other. When buying a harpsichord, don’t be fooled by how gorgeous it may look, it clearly has nothing to do with how it performs. If someone tells you otherwise, find an expert (like me!) to consult about the quality of the instrument. French doubles almost always have 5 octaves with a disposition of two 8-foot (notated 2 X 8') stops, one 4-foot stop (1 X 4') and a buff stop, sometimes called a lute or harp stop because it produces a sound similar to those instruments. Q: What is the difference between a harpsichord, virginal, spinet and clavichord? A: Virginals and spinets are harsichords, and both have one set of strings, a 1 X 8' stop. 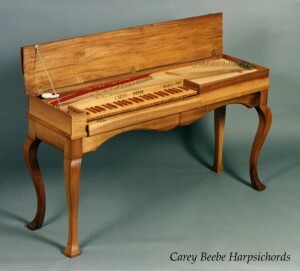 Clavichords are not harpsichords because, like a piano, a hammer sets the string vibrating; they are not plucked. Virginals are instruments that are plucked like harpsichords, but are strung laterally so that the quill plucks the string much closer to the middle of the string, rather than near the end as it does in a harpsichord. The sound is quite different! A clavichord is a sensitive, soft-toned keyboard instrument. When you press a clavichord key, a metal tangent hits the string from below, sounding the note. Variable pressure on the key causes vibrato. No other keyboard instrument can do this! 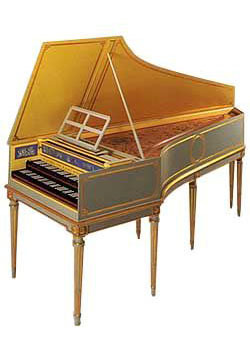 Q: So how does a harpsichord work? A: When you sit down at a harpsichord and press a key, the key (which extends far beyond your visual range) pushes the jack upwards, causing the plectrum (quill) to pluck a string. Nowadays, most people use delrin as their quill material, rather than crow. When you release the key, the tongue allows the plectrum to rotate past the string and a damper stops the string from vibrating. That is all there is to it! Bravo! Q: What do you mean by disposition? A: Disposition describes your hardware layout. Q: So what is an 8-foot stop? A: It refers to the pitch of an 8-foot long organ pipe, or “normal pitch.” A 4-foot stop sounds an octave higher. The “stop” lever turns the register on and off. Q: So what should I buy?? What kind of music do you play? Your musical ambitions and desires help determine the right choice for you. Whether you like to play solo or continuo, early, baroque, chamber, contemporary or jazz, the following factors should help you focus your thinking. Clavichords have about 3-5 octaves; virginals, 4-5. Most harpsichords have between 4-5 octaves also, and may have one, two, or, would you believe, three manuals (keyboards).Check the requirements of your repertoire. REMEMBER, when I was studying harpsichord we were never allowed to have an instrument that didn’t have at least 5 octaves and 2 manuals. At this moment, I’m talking to the serious student and player. I had to say that because it’s true. By now, you should be able to think about the type of instrument that is appropriate for your needs. If not, that’s OK, too. The sound and action vary tremendously between the historical styles and from maker to maker. The only way to choose is by playing as many instruments as you can. The real truth is players know! When a person switches from piano to harpsichord (which is how it happens, because nobody grows up with a harpsichord in their house [except my son Hunter, who is not a harpsichordist … not yet, anyway]), it takes lots of time of playing a harpsichord and then another harpsichord, and ANOTHER HARPSICHORD, and one day it feels natural to play a harpsichord, and then you know what a harpsichord is, and then you know the difference between one harpsichord and another. Go with your maestro, find one, find two, find three! I’m serious. Q: So how do I know if it is a quality instrument? A: If you are ready to make an investment of this size, you want to know that it will last for generations. It either lasts for a day or two, or it lasts way beyond your lifetime. And do not trust everything you hear on the Internet. You have to talk to a player, and find out if the maker’s instrument holds up to practicing and concert conditions. And don’t ever underestimate yourself.You need the same kind of instrument because if it doesn’t function, you can’t play it.